I’ve been a big fan of the Lloyd’s Building ever since I had to draw it for a GCSE art project at school. But, it was only recently that I managed to get on a tour (thanks Mike!) of what I believe is one of the most striking buildings on the planet. Lloyd’s of London takes its name from Edward Lloyd who founded a coffee shop on the site in 1688. It’s not to be confused with Lloyd’s Bank. Lloyd provided the tools to do business (coffee, etc), leaving the owners of boats free to negotiate insurance deals amongst themselves. The Lloyd’s Building of today, built from 1978 to 1986 by Richard Rogers, operates along similar lines. Rogers is considered to be one of the finest architects on the planet and is also responsible for the Centre Pompidou in Paris, the Madrid Airport, the National Assembly for Wales and the Millenium Dome. 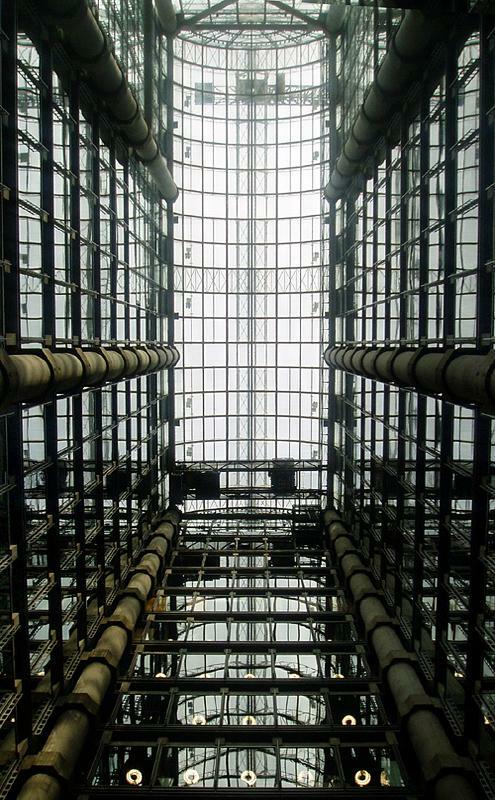 The concrete and stainless steel Lloyd’s Building consists of six towers around a central atrium with electrical power conduits, water pipes, staircases and lifts on the outside. In fact, the 12 external glass lifts were the first in Britain. It’s approximately 76m high and has 14 floors. Technically-minded readers may be interested to know that 33,500m3 of concrete, 12,000m2 of glass and 30,000m2 of stainless steel cladding were used during construction. Placing services on the outside provided complete internal flexibility. As a result, the total possible underwriting area is 19,000m2. The Lloyd’s building of 1928 was demolished to make way for the present one and its impressive main entrance was incorporated into the new building. Other features from the past include the Lutine Bell and the Committee Room. The Bell sits in the Underwriting Room, at the foot of the famous atrium, and is rung whenever there is important news to be announced. The Italianate Committee Room on the 11th floor started out in the 18th century as a dining-room. It was designed by Robert Adam in 1763 and was carefully brought in sections from the previous Lloyd’s building of 1958 across the road. As far as modern architecture goes, there’s a fine balance to be struck between fitting in with the neighbours and pushing forward the boundaries of progress. There was no way to predict whether or not the Lloyd’s Building would work – the only way to find out was to build it. Thankfully, it worked perfectly.